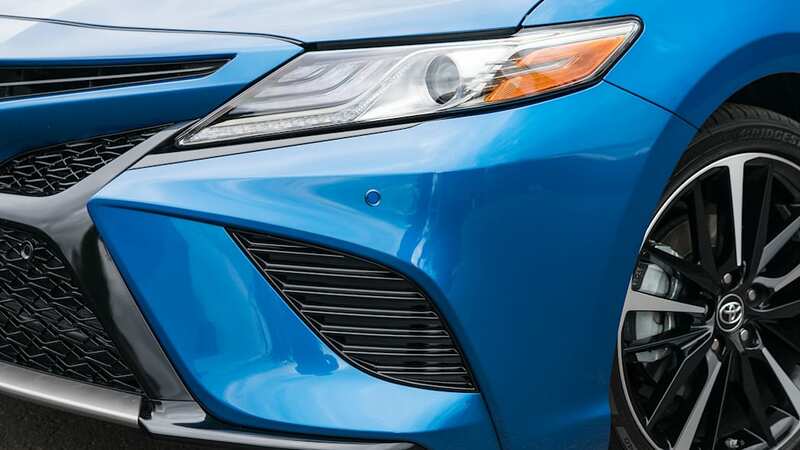 Toyota's designers and engineers come across like happy dogs that have finally been allowed to run around the backyard after staring at it forlornly through the screen door. The squirrel they've missed out on menacing, however, has been creating cars that people might actually desire to behold, drive, and own. "We wanted to go beyond the dependable Camry we've had all these years," said Chief Engineer Masato Katsumata. In this case, "dependable" is quite clearly loaded to also equal "dull" and "conservative." He and his team were capable of more and were finally allowed to pull it off, seeking to achieve "not-Camry-like dynamic performance." 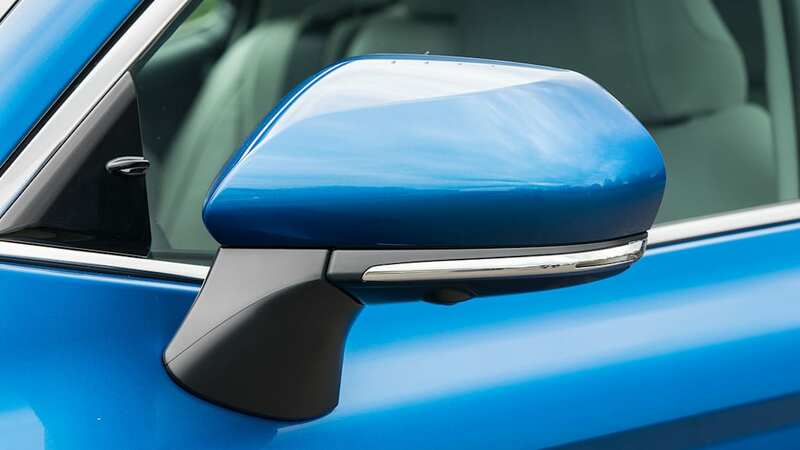 And then there's the lower, wider, sleeker, and just plain better design, penned by Ian Cartabiano, a man whose résumé includes two of his company's most recent design successes – the Toyota C-HR and Lexus LC – and someone who regrettably joined up at roughly the exact time in the late 1990s when Toyota stopped making interesting cars. Well, the screen door was finally slid open. "I've never been one to say that executives can make a really big difference, but Akio Toyoda has made a huge difference," Cartabiano said of Toyota's chairman, who has made it abundantly clear that he wants the company with his family's name on the door to produce more dynamic, desirable, and just better cars. "C-HR, LC, this Camry ... none of those cars would've happened five to 10 years ago. It's because of him." Well then, because of him, the 2018 Toyota Camry is a home run. 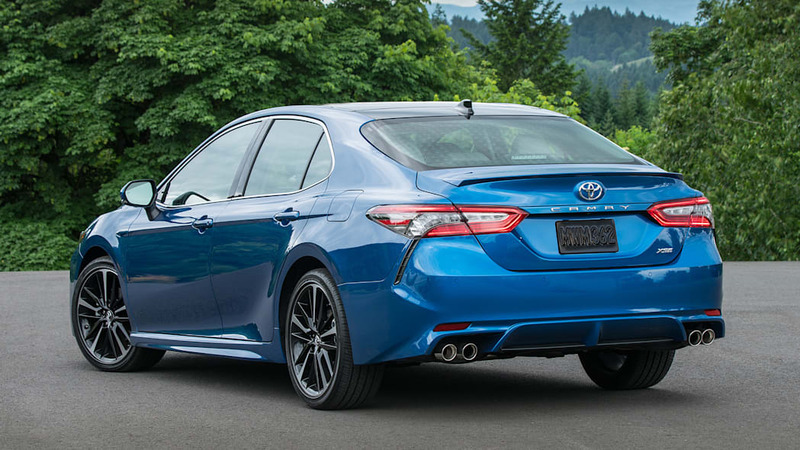 There was a 1989 Camry on hand at the first-drive event in Oregon's Willamette Valley, but this new model is such a fundamental departure from everything that came before that it probably could've been named something else entirely. 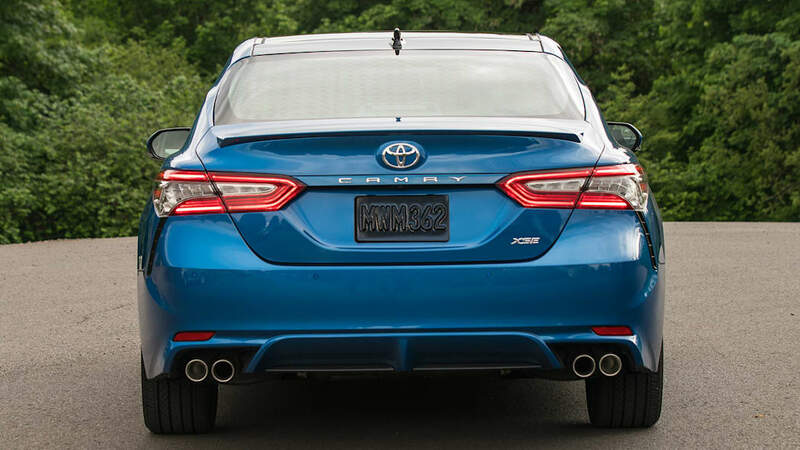 Of course, that's a horrible idea for the nation's best-selling car, so changing the font on the trunk for the first time in ages will have to do. 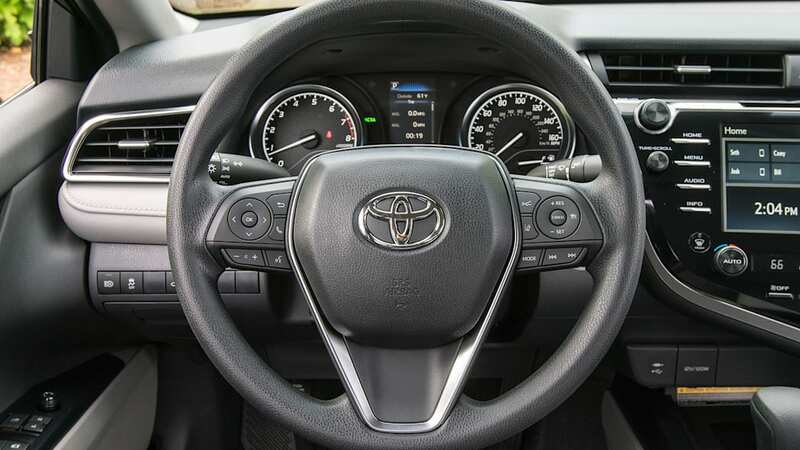 Behind the wheel, the 2018 Camry is almost reminiscent of a Mazda, with precise and consistently weighted steering, tidy body control, and a lower, driver-focused seating position that puts the controls where they feel most natural. And you don't even need to buy the supposedly sportier SE trim level to get that. Indeed, the gap between the SE and the former puffball LE trim level (ditto the ritzier XSE and XLE) has shrunk to the point where it's fairly difficult to tell the difference in normal driving. That's a good thing. In fact, Katsumata confirmed there's not really a significant difference between the two trim lines, insisting there was no desire to make an artificial difference between the two. The LE is therefore dynamically gifted, benefiting from the same improved composure through corners and over road imperfections as the SE (kudos the new double wishbone rear suspension), while there were supposedly tradeoffs made to comfort. Meanwhile, the SE now soaks up bumps better and it's hard to envision traditional LE buyers complaining, either. Now, the SE does seem to have a bit more steering weight, and definitely has superior grip from its bigger, stickier tires, but we can't say you'll be missing out on much if you prefer the LE's look and price tag. In any case, the 2018 Camry is legitimately good to drive – rewarding even. 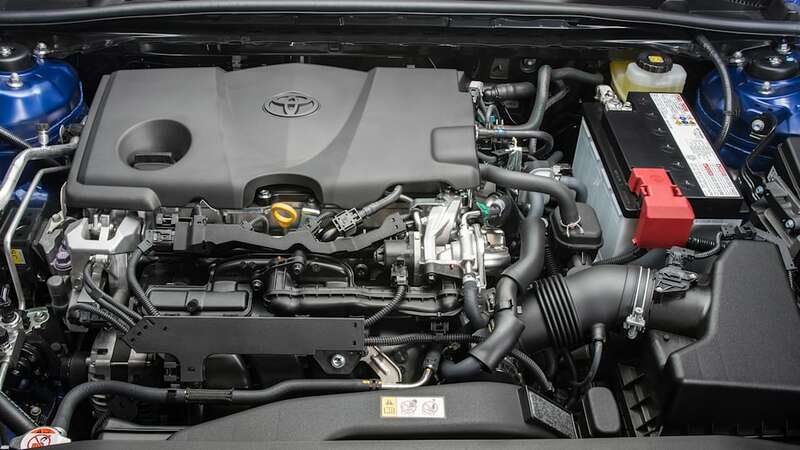 And then there are the new engines, with the 2.5-liter four-cylinder in particular being all-new to the Camry, and to Toyota as a whole. 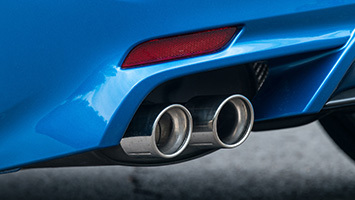 Here is where another Mazda comparison can be made, as Toyota chose to maximize the possibilities of the naturally aspirated engine rather than resorting to the usual fuel-saving tricks of auto stop/start, a CVT, or turbocharging a smaller-displacement engine. 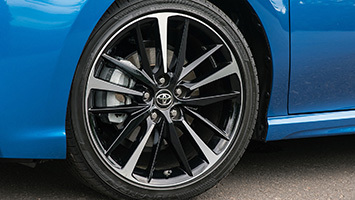 Instead, Toyota utilized a high compression ratio of 13.1 (the Hybrid's version is 14.1) along with both port and direct injection, an increased stroke, a cooled exhaust gas recirculation system, a variable cooling system and oil pump, and a variable valve timing system that utilizes an electric motor instead of oil pressure. Altogether, it results in 203 horsepower and 184 pound-feet of torque and estimated fuel economy of 28 mpg city, 39 mpg highway, and 32 mpg combined in most trims. 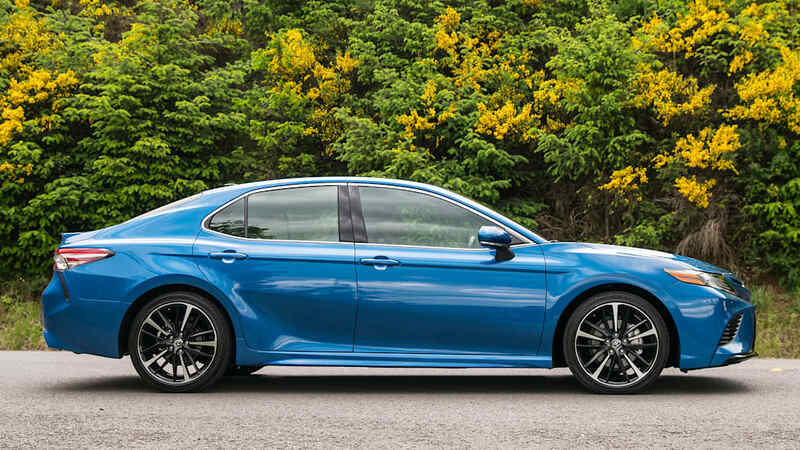 That's class-leading, and in practice, the new four-cylinder powertrain is impressive, doling out smooth, energetic power without eco throttle mush, turbo lag, or CVT rubber-bandyness. In fact, the four-cylinder is so good that it makes the 3.5-liter V6 seem unnecessary (maybe Mazda was onto something with the 6). 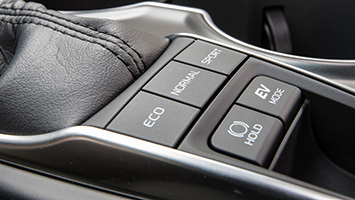 Sure, this modified version of what's in the 2017 Highlander and Sienna produces massive power for a family sedan – 301 hp and 267 lb-ft – but it seems like overkill, results in some torque steer, and its added weight over the nose hampers the car's balance and seems to result in added electric steering assist. 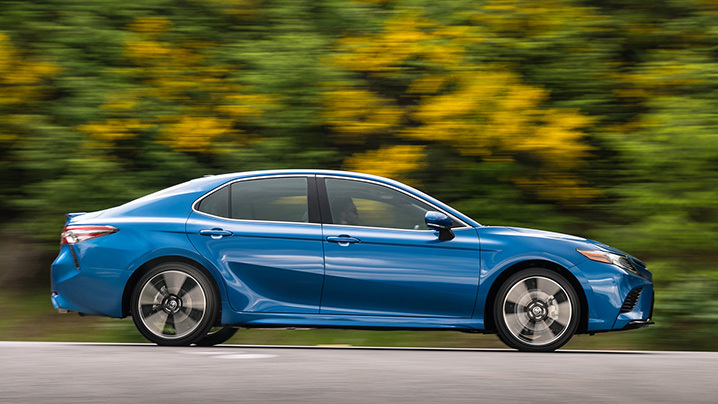 In back-to-back test drives, the V6's steering felt less consistent and linear ­– actually, it felt more Camry-like. 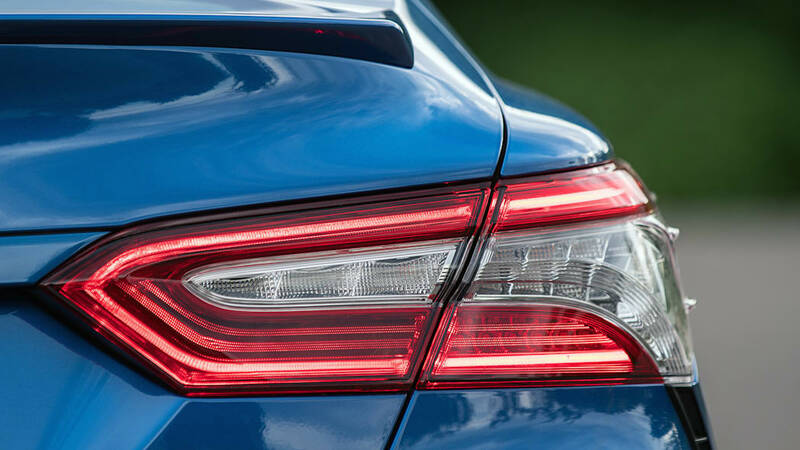 The best balance, however, is actually found in the 2018 Camry Hybrid thanks to its battery pack being relocated from the trunk to underneath the back seat. It also lowers the center of gravity. 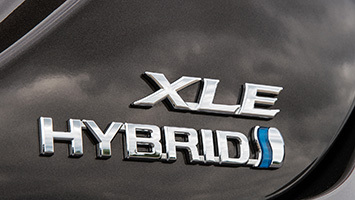 "The Hybrid is most balanced. It is the best," Katsumata stated definitively. We're not entirely sure about the "best" bit overall, but we agree that his team achieved more than just superior fuel economy. 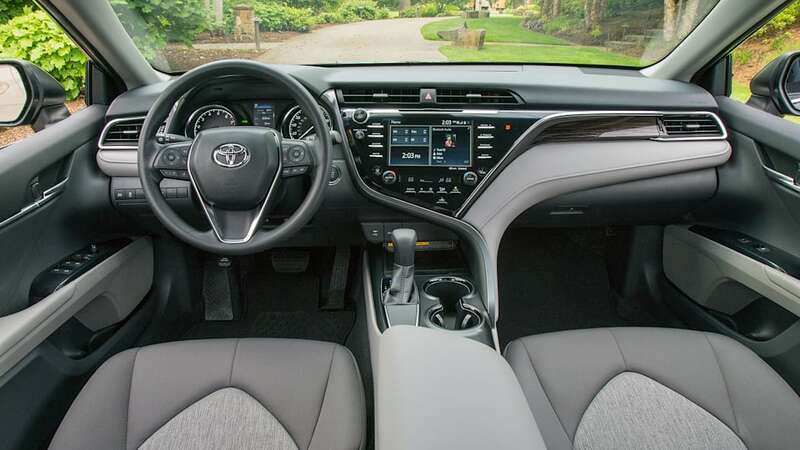 Nevertheless, its thriftiness is still what stands out: 51 mpg city, 53 mpg highway, and 52 mpg combined, or essentially the same as most Prius trim levels. Two points to be made about that. 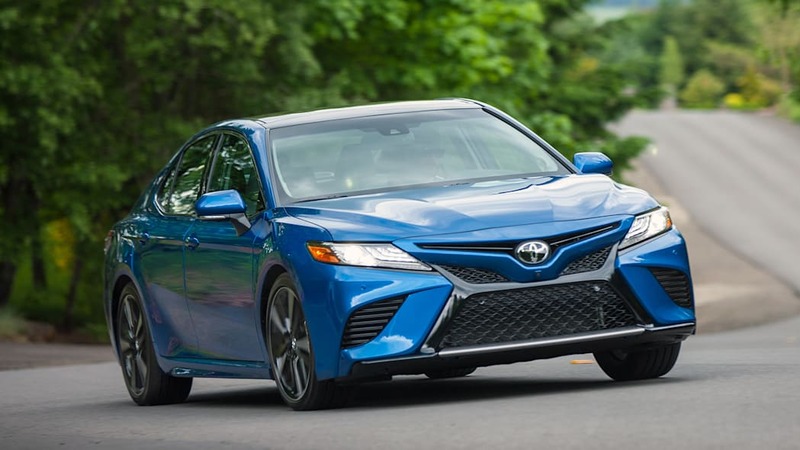 First, having driven a 2017 Prius Prime to the Camry event, we can say that the new Camry Hybrid is a substantially more comfortable and engaging car to drive. Way better looking, too. 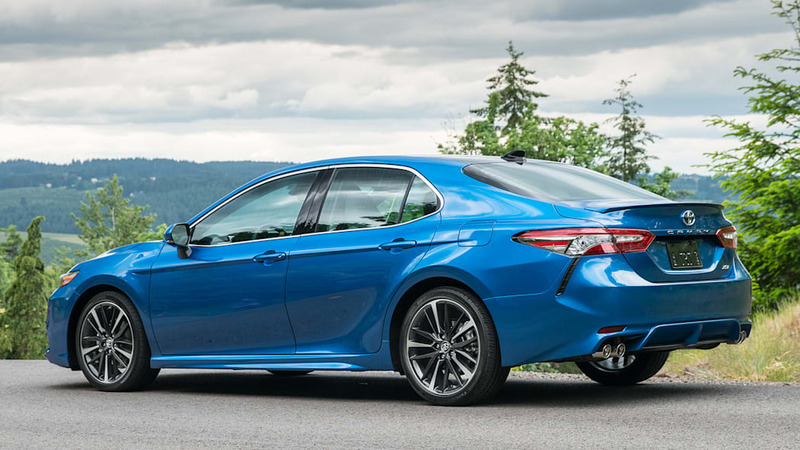 Second, and less positively, that fuel economy is restricted to the Camry Hybrid LE due to its smaller tires and lithium-ion battery pack. That's not a huge deal given how good the LE is, but it's still hard to understand why the SE and XLE versions stick with a nickel-metal hydride pack that results in 44 mpg city, 47 mpg highway, and 46 mpg combined. 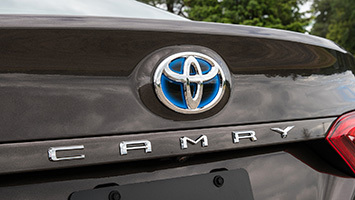 Katsumata said the cheaper battery pack allows for the greater feature content the buyers of those trims prioritize over maximum eco-friendliness, but the math doesn't really add up when you compare the trim levels, feature content, and prices among the respective regular and Hybrid Camry trim levels. 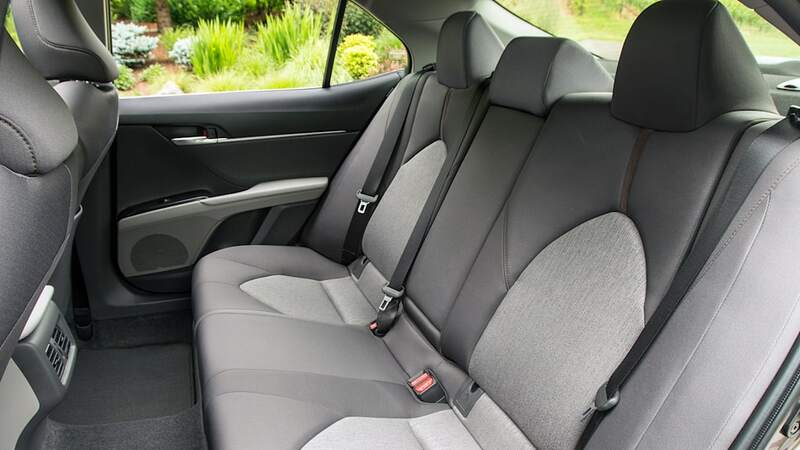 Now, as impressive as the new platform, suspension, engines, transmission, and exterior design are, it's the cabin that's bound to be most appreciated by the inevitable 300,000 or so buyers who take one home. 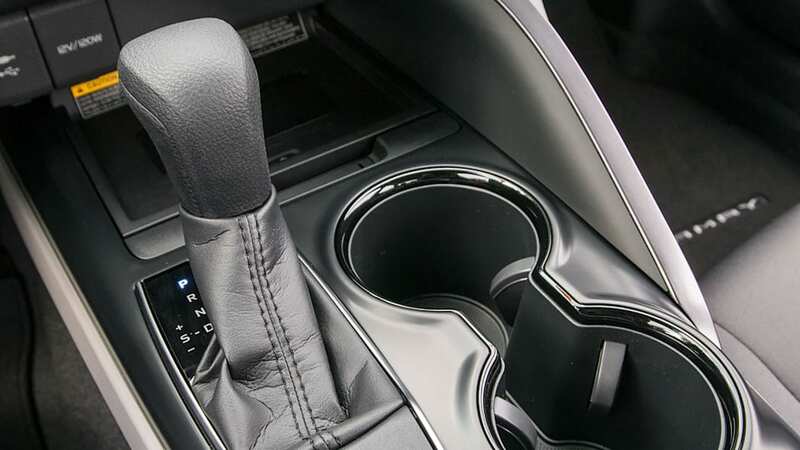 The quality of materials is way up, with the old car's disjointed hard plastic surfaces and ridiculous stitched rubber dash top replaced by a more appealing, driver-focused design with softer, more nicely textured surfaces everywhere. 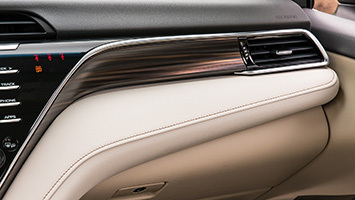 The stitched stuff on the dash is now a more convincing simulated leather, the cloth and SofTex vinyl upholstery has a greatly improved look and feel, and the gloss black trim around the also-improved switchgear looks suitably lux. 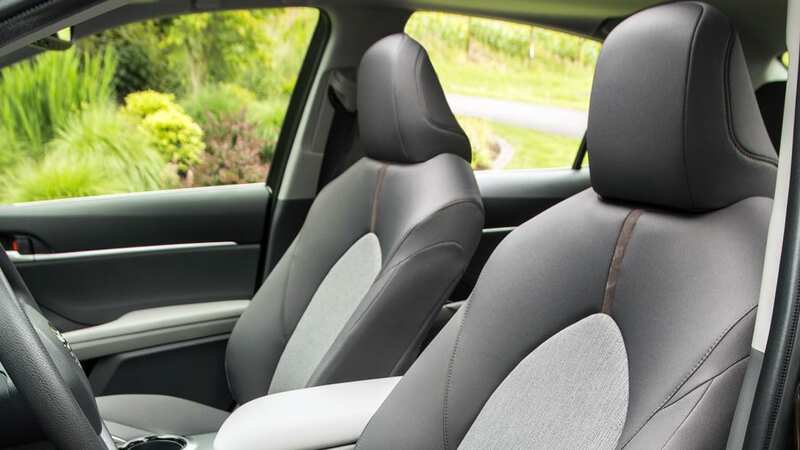 And perhaps the best part is that the visual and quality differences between the LE and supposedly ritzier XLE are pretty much restricted to extra equipment and seat upholstery. You're not missing that much. Heck, even the traditionally rental-spec L model is crammed with equipment at its base price of $24,380. 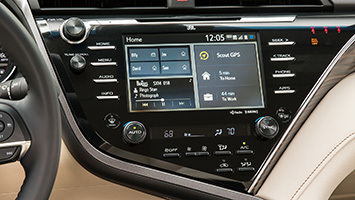 Every 2018 Camry gets standard adaptive cruise control, forward collision warning and auto brake, lane-departure warning, bi-LED headlights, and the latest Entune 3 touchscreen interface that features improved responses, better graphics and larger icons (a seven-inch version is standard; an eight-inch version optional). 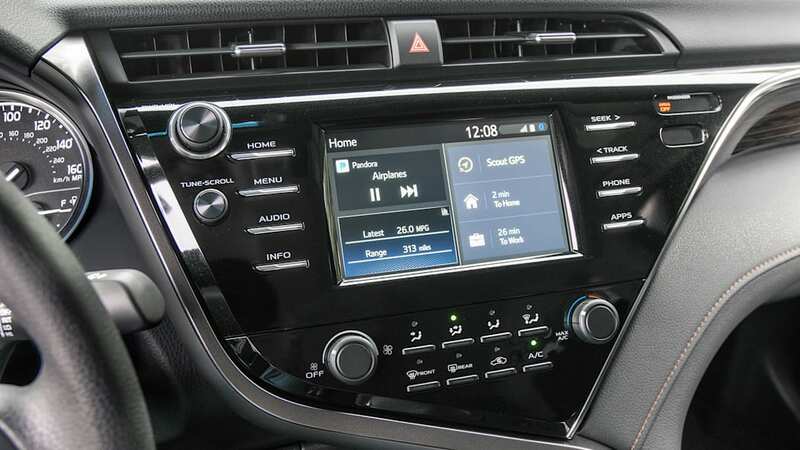 Key new features that are available on the XSE and XLE trims include a full-speed adaptive cruise control system that can handle stop-and-go traffic, three vehicle setting modes, an electronic parking brake, a panoramic sunroof, a color heads-up display, three USB ports, and a nine-speaker JBL sound system that includes Clari-FI digital music clean-up. 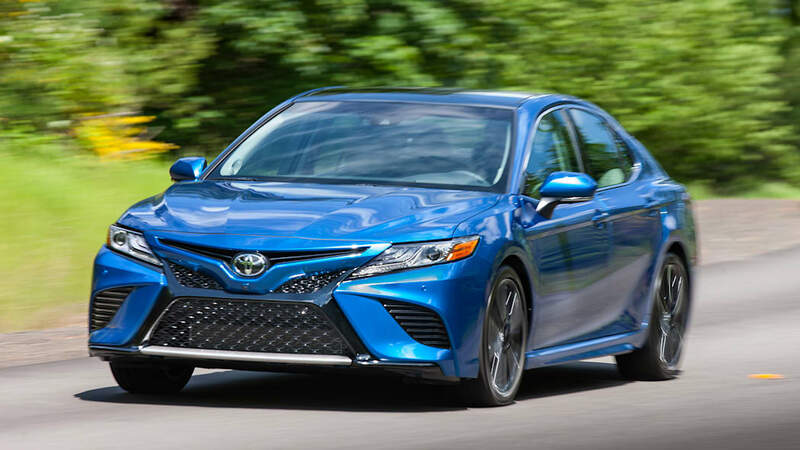 And in terms of space, the new Camry offers better storage up front, a 15.1-cubic-foot trunk no longer reduced in the Hybrid, and a bigger cabin despite a one-inch lower roof height (the seating position was lowered by a roughly commensurate amount). Visibility was even improved by the significantly lower window sill and thinner A pillars. In other words, the new Camry is even more practical than its predecessors, which in recent memory skated by on reputation and loyalty. They didn't have to have a great interior, they didn't have to be great to drive, they didn't have to look that good, and they certainly didn't need to lead the pack in critical opinion. Scores of customers just didn't care and/or didn't know what they were missing. 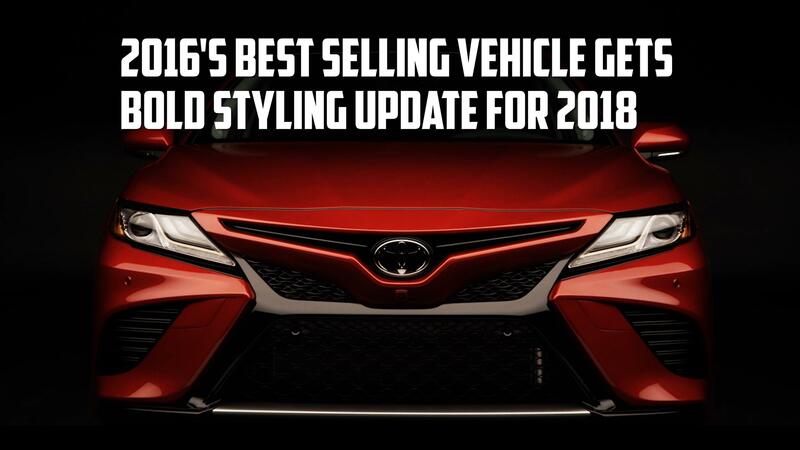 Well, something really has changed, because the 2018 does have a great interior, it is great to drive, it does look good, and this critical opinion states that if it isn't THE class leader, well, it's bound to be on the podium.